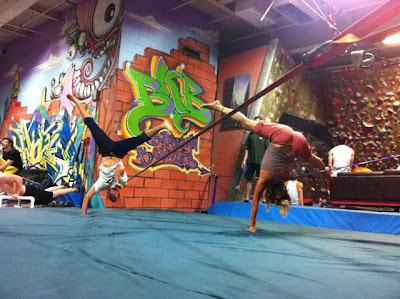 Yesterday was the first official slacker stylz meeting on Brooklyn Boulders turf where the regular YogaSlackers eLine set up was joined by the Gibbon line for some wild style tandem slacklining madness. I was joined by Gibbon team member Josh Greenwood for an epic 3hr slackline session where we shared tricks, styles and tips for all things yoga, jumping, turning and transitioning on the lines. Not only did we learn a bunch about each others lines we found that the practice of switching back and forth was incredibly humbling…I could barely walk on the eLine after a jumping session on the Gibbon line which uses a ratchet device to tighten it so that it is more like a trampoline with tons of fun bounce to play with. And bouncing, just like learning to walk on the line for the first time, can get pretty addictive – I feel a bit like I got kicked in the stomach today and can’t remember the last time my abs were so sore. Josh also rocked out a bunch of yoga poses on the line learning our inversion and practicing boat pose variations until he stepped off also clenching his core muscles and stating that it was “so intense for your abs”. Fortunately it took about 2 seconds recovery time before he was back up doing flips and drops that are surreal to watch in person. 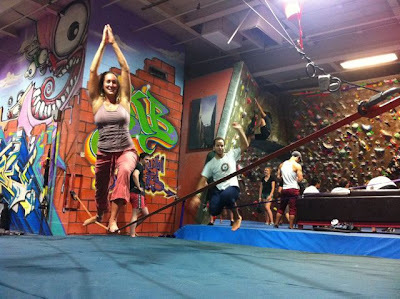 As slacklining gains more and more popularity it is easy to look at other styles and question them. This happens far too much in the climbing world and Josh and I both agreed that it would be pretty cool if all slackers could continue to support each other and the unique styles that are forming and taking off in all sorts of innovative directions. 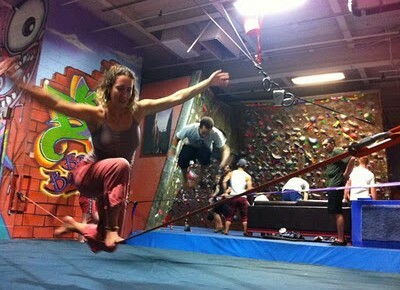 We are both super psyched for the upcoming Slackline Series at Brooklyn Boulders starting this Sunday and now offering 7 different classes Sun-Tues. We look forward to sharing our unique styles with each other and with students as the sport develops and new slackers join the scene.